The International Registration Plan (IRP) is a method of registering fleets of vehicles that travel in two or more member jurisdictions. All contiguous states, including Washington D. C., and most Canadian provinces are members of the plan. IRP distributes registration revenue among the member jurisdictions. Each member jurisdiction receives its proportional share of registration fees for each vehicle registered under the IRP fleet. For purposes of fleet registration, the base jurisdiction must be where the registrant has an established place of business, where mileage is accrued by the fleet and where operational records of the fleet are maintained or can be made available. Have an established place of business in Kansas. The place of business must be a physical structure owned, leased or rented by the fleet registrant. Have a publicly listed Kansas telephone number in the name of the fleet or a person to contact during normal business hours. Have mileage accrued in Kansas by the fleet. Have operational records of the fleet in Kansas or be able to make them available in Kansas for audit. Travel in two or more IRP jurisdictions (including Kansas). Are used for transporting persons or property. Have a registered gross vehicle weight or actual weight in excess of 26,000 pounds (property carrying vehicle). Are a power unit with three (3) or more axles regardless of weight, including buses. Are used in combination and the actual weight of the combination exceeds 26,000 pounds. Make intrastate hauls in a jurisdiction other than Kansas, regardless of weight. Vehicles displaying restricted plates such as equipment, dealer or farm plates. Recreational vehicles, such as motor homes, that are not used in connection with a business. Submit a Kansas Apportioned Registration Application and a Schedule C along with all required paperwork. Provide proof of Heavy Vehicle Use Tax (HVUT) filing with IRS (Form 2290, Schedule 1), if applicable. 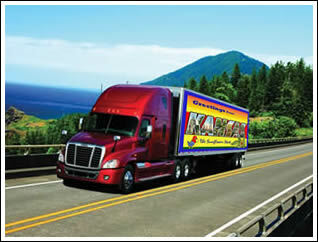 Commercial Motor Vehicle Office will calculate your apportioned registration fees and provide you with an invoice. Return the invoice and submit the appropriate fees. In return, the Commercial Motor Vehicle Office will provide apportioned license plates, and cab cards for each vehicle. The IRP requires that all registrants maintain records to support the reported miles in all jurisdictions. Records must be kept for the current registration year plus the previous three years.